The TFL statewide grand final of 1988 played between the Devonport Blues and the Glenorchy Magpies at North Hobart Oval is famous as the first instance where a team from the northern half of Tasmania was able to lift the premiership cup. More infamously, the game was a brutal affair and arguably the last match to see large melees and multiple player reports in the time before sending players off became possible under the laws of football. The game entered the annals of Tasmanian football history after a strong build-up of expectation in both the northern suburbs of Hobart and on the North West Coast at Devonport. A huge statewide league grand final crowd of almost 18,000 paid over $100,000 collectively to watch the game and see the Devonport Blues conclusively win the fights and the football. Devonport: R. Brown (4), D. Lee (2), D. Scott (2), L. Perry (2), C. Reynolds, K. Wilson, D. Code, C. Fagan, W. Jaffray. Glenorchy: D. Mansfield (3), M. Styles (2), C. Smyth (2), A .Fletcher. > K. Wilson (Devonport) for striking runner F. Clarke (Glenorchy). > D. Martin (Devonport) for striking unknown player (Glenorchy). > R. Gilham (Devonport) for striking A. Howlett (Glenorchy). > D. Cullen (Devonport) for striking A. Fletcher (Glenorchy). > D. Cullen (Devonport) for striking T. Tovey (Glenorchy). > D. Mansfield (Glenorchy) for striking G. Enniss (Devonport). > D. Mansfield (Glenorchy) for striking R. McCormack (Devonport). > L. Lockley (Glenorchy) for striking C. Fagan (Devonport). > L. Lockley (Glenorchy) for striking R. McCormack (Devonport). > L. Lockley (Glenorchy for unduly rough play towards C. Fagan (Devonport). IT’S BLUES! Devonport pride of north after bruising victory. CUP OF JOY. Blues win fight – and flag! 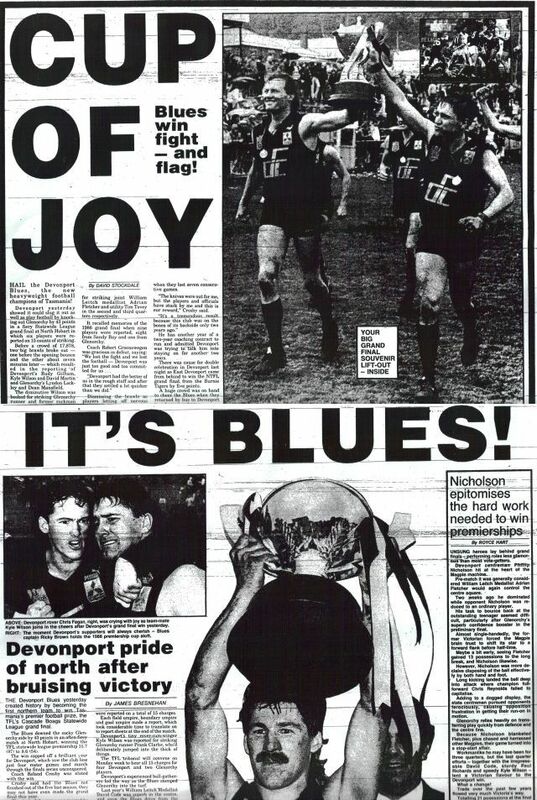 The Mercury reported: “Hail the Devonport Blues, the new heavyweight football champions of Tasmania”. Devonport showed it could slug it out and play football in defeating Glenorchy by 43 points while six players were reported on 15 charges along the way. The nearly 18,000 people in attendance saw two big brawls break out before the game began and seven minutes into the first quarter, before players settled into a more controlled aggression at the ball. The game recalled memories of the grand final two years earlier when Sandy Bay were defeated by Glenorchy and a total of nine players were reported. BLUES BRING THE FLAG HOME. The Examiner reported that perhaps the master stroke of the grand final was the act of the umpires in bouncing the ball before the siren sounded in a desperate attempt to curtail the all-in brawl that had broken out before the game started. The report continued that both teams were at fever pitch and not willing to back down from physical confrontation. The whole game was a tough and uncompromising affair. The key moves in the game were the placement of future draftee, Dion Scott, to centre half forward where he became an important target for the Blues and the blanketing role played by Phil Nicholson on Glenorchy’s young Leitch Medallist and future draftee, Adrian Fletcher. Nicholson curtailed Fletcher to such an extent that he was moved to a flank and in any case his work released Devonport’s own Leitch Medallist, David Code, for a best on ground effort in the pivot. > Having put together something of a ‘foreign legion’ of star players from across Victoria and Tasmania they were desperate to prove themselves having missed the finals the previous season. > The Devonport team of 1988 were first or equal first on the ladder for the whole season and went through the finals series undefeated. > The premiership is the first by a team from the northern half of the state in the new Statewide League. > Glenorchy were playing their thirteenth grand final in 14 seasons and looking to win their fifth and thus improve on their poor conversion rate in the big one. > The new Glenorchy captain-coach Robert Groenewegen had completed his time in the VFL with Footscray and had a challenging initiation to Tasmanian football being reported five times in the season and missing two finals games through suspension also. > A huge crowd of 17,878 paid over $100,000 to watch the game. > The game commenced with a large melee before umpires could get play underway and ultimately the umpires started the game without the siren sounding. > Six players were reported on 15 charges and subsequently five were outed for a combined total of 18 weeks.